For more than 100 years, Jack London’s adventure novel Call of the Wild has been celebrated as a powerful testament to the beauty of nature. When Twentieth Century Fox set out to adapt the book as a film in 2018, the studio sought to honor this legacy by producing the film in the most environmentally responsible way possible. From the earliest days of production, the cast and crew dedicated themselves to reducing waste, recycling used materials, prioritizing responsible food service, and embracing renewable energy. These efforts helped the project divert more than 82% of its waste from landfill and generate significant cost and carbon savings in the process. Call of the Wild follows John Thornton, played by Harrison Ford, as he treks across the Yukon Territory during the Klondike Gold Rush of the 1890s, a story of ambitious scope that posed a number of sustainability challenges. To accurately bring the story to life, the Construction Department would have to erect multiple era-appropriate Alaskan towns, the Special Effects Department would have to create tons of fake snow, and the extensive use of outdoor locations would make it much more difficult to access clean energy sources. However, the leadership team of Executive Producer Diana Pokorny, Production Supervisor Gavin Behrman, and Sustainability Manager Adrienne Pfeiffer worked with the crew to meet every obstacle as it arose. Pfeiffer met with each department before filming began to set environmental goals for production, develop the best strategies to meet these goals, and track progress throughout the nearly six-month shoot schedule. As these conversations took place, crew members across the production began to make suggestions for greater sustainability, including Stunt Coordinator Charlie Croughwell, who in 2015 founded a nonprofit called the Earth’s Oceans Foundation. The organization recycles and repurposes used plastics into new products for commercial and personal use, such as building materials, exercise equipment, boating safety gear, and more. Call of the Wild began working with Earth’s Oceans just a few weeks after filming began, and over the course of the production, the organization recovered 4.75 tons of used plastics from the set, including hard-to-recycle plastics such as latex gloves, latex sponges, and dirty foam. Single-use plastic water bottles were banned at each of the film’s six filming locations in favor of refillable ones, which were gifted to the cast and crew. This practice avoided the use of 201,920 plastic bottles, saving more than $33,000. Craft Services committed to a rigorous food service plan, consistently offering vegan dining options, selecting local, organic food products, and providing biodegradable, compostable plates and cutlery. 30,753 pounds of food and cutlery were composted, avoiding the emission of 22,111 pounds of greenhouse gases (CO2e). Leftover food was collected and donated to those in need in the California communities where the movie filmed, through partnerships with the Hollywood Food Coalition and Rock and Wrap It Up. The crew collectively donated 1,515 pounds of food, roughly 1,262 meals. 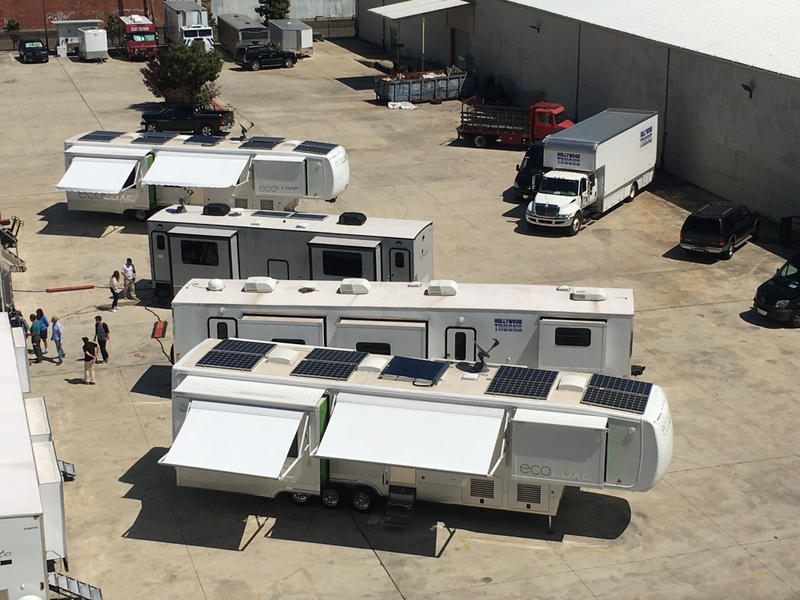 The movie filmed for more than a month at Sable Ranch in Santa Clarita, California, which allowed the crew to install long-term solar-powered generators, electric vehicle charging stations for crew use, and Ecoluxe Solar Trailers. The crew purchased two DC Electric solar-powered work lights for use at the Sable Ranch base camp, then quickly expanded their stock to eight once the lights’ high quality and energy efficiency was discovered firsthand. Sable Ranch asked for the Call of the Wild sets to remain on their land permanently, for use in future film projects. This reuse of materials avoided tons of landfill waste. Vendor DeRouchey Foam bought back 17 of the 21 tons of foam purchased by the Set Construction for reuse and recycling. The production office purchased 100% recycled content paper for white copy paper and 30% recycled content paper for colored copy paper. This policy saved more than 1,044 pounds of greenhouse gas emissions. 21st Century Fox regularly leads efforts to go green behind the scenes of its film and television productions, including recent projects such as Legion and The X-Files . The company was also one of the co-creators, alongside other Hollywood studios and the Producers Guild of America, of the Green Production Guide, a comprehensive collection of sustainability best practices and green vendors.